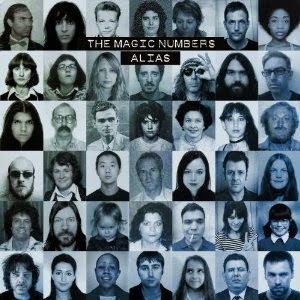 The Magic Numbers are back with their fourth album Alias. It's their most accomplished and adventurous yet, nodding respectfully to their influences, dripping in gorgeous vocal harmonies and sounding like a band making music for the love of it. The Magic Numbers have had a hard time since the massive success of their self-titled debut. The instantly accessible Forever Lost, Love's A Game and Love Me Like You won them an army of adoring fans, but they only represented a very small part of what they are about musically. Whilst they've continued to write the odd three minute pop gem - see Take A Chance and Why Did You Call - those fans that had warmed to those big hits off the first album deserted them and their last album The Runaway only crawled to number 46 in the UK charts. Rather than panic blindly at this, Alias sees them remaining true to their roots and influences with no attempt at writing something blatantly commercial. Shot In The Dark does manage to be their most radio-friendly single since the aforementioned Take A Chance. Thought I Wasn't Ready, sung mainly by Angela, has a beautiful summer feel to it that would light up the airwaves should it be released as a single. And recent single END has all those male/female dueling vocals that many see as their trademark sound. Accidental Song builds from a hushed minimalist string track in the first verse into a hundred mile an hour stomp driven along by Sean's drums and Michele's bass. But they all feel organic and not contrived and sculpted to be that way. Past these four songs though, the album takes on a much darker edge. Romeo Stodart's lyrics have always, even in those moments that engraved them into the music buying public's consciousness, been introspective, plagued with doubt and insecurities and only at times displaying cautious optimism. Nothing changes here, the album starts with the six minute Wake Up, a simple repetitive piano note dictating the first verse and the opening line "we're imprisoned by our own attitudes". The song builds into a dramatic chorus with strings, before a wall of noise drowns out the vocals four and a half minutes in until the song drops back down to that solitary piano. It feels like it's been meticulously constructed with so many ideas in the one song without suffocating it. And that runs through a number of songs on the album, track two You Know feels like a different song from two and a half minutes in, its cry for help "if you're disappointed with me, why don't you come and save me from myself" being replaced by the promise that "all through my life, I'll wait for you". There's judicious use of strings across the album too. Roy Orbison is positively dripping in them and is all the better for it, contrasting with the "don't tease me, just let me believe tonight" to a disinterested target of the subject's affections. There's touches of them in Accidental Song and in the breakdown of Better Than Him and they're used to change the mood. The album gets darker as it reaches its conclusion. Penultimate track Enough starts with a brooding build and sees Romeo asking himself "is it ever good enough? am I ever good enough?" as he lets loose on guitar over the chorus and the subject matter moves on to dancing with the devil and voices in the head. Closer Black Rose is full of stop/start sections, jumps from quiet to loud and is the most adventurous thing they've done. Romeo and Angela share backing vocals as the song moves from rumbling bass sections to crashing sections of drums and guitar and then back again. It's difficult for a band reaching their fourth album when their commercial peak so far was their debut. They will have progressed as a band faster than the expectations of most of their listeners, who hark back to what made them fall in love with them. Alias is a classic case of this. The Magic Numbers have steadfastly refused to conform and write a pop album to satisfy the tills and the accountants. It's their best record so far by some distance because it makes no compromises and you can feel the love, sweat, blood and tears that have been put into it from the very first to the very last note. Alias is out today on CD, double CD, vinyl and download. They are performing at the following in-stores this week - Head Bromley (11am) and London Rough Trade East (7pm) on Monday 18th, Union Music Lewes (2pm) and Cult Hero Brighton (6pm) on Tuesday 19th, Pie And Vinyl (12pm) and Head Bristol (6pm) on Wednesday 20th, Head Warrington (11am) and Nottingham FOPP/HMV (5pm) on Thursday 21st and Head Leamington Spa (11am) and Cambridge HMV/FOPP (5pm) on Friday 22nd. And they are touring with support from Ren Harvieu in September at the following venues - 10th Glasgow Garage, 11th Liverpool East Village Arts Club, 12th Manchester Academy 2, 13th Leeds Met Uni, 15th Sheffield Leadmill, 16th Birmingham Institute Library, 17th Bristol Bierkeller, 20th Cambridge Junction, 21st Oxford O2 Academy 2, 23rd Brighton St Georges Church, 24th Portsmouth Wedgewood Rooms and 25th London Forum. 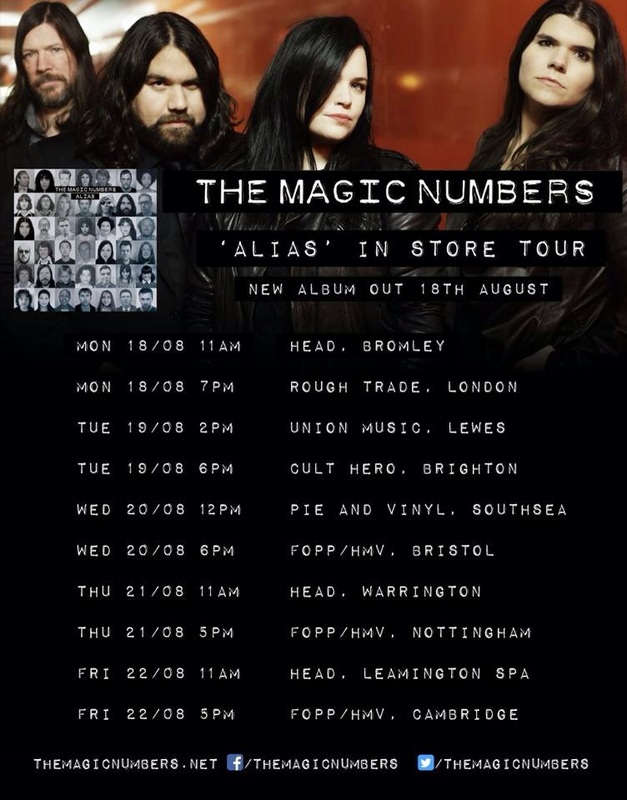 The Magic Numbers' official website can be found here. They are also on Facebook and Twitter.